When I had to temporarily pack up my studio, it was quite an ordeal in so many ways. I knew I’d continue making jewelry, but I’d have a small space to do it in. So I had to be selective (painfully so) about what I kept with me. I had to pare down tools as well as techniques–and it’s hard to play favorites! It was like picking a favorite child (or pearl)! Specialty tools and jewelry-making supplies that I rarely use were boxed up. Double-duty and uber versatile tools like my torch heads and fire tools for soldering, annealing, and enameling had to stay at hand. Gemstones and gem beads filled nearly a whole storage container, but my pearl collection and drilled pearls made the cut, natch. Resin and its entourage stayed; polymer clay and its big pasta roller had to go, along with so many others. Ouch! It’s easy to get bummed about the techniques I can’t do right now! But there’s sooo much I can do in my temporary small space. In fact, I’m pretty impressed with all I’m able to accomplish on a small table. Having fewer supplies and less space forces me to be more efficient and more creative. It all sort of jumped out at me when I saw our collection of kitchen-table metalsmithing video workshops. Here are three of my faves and one we haven’t talked about before. Do you love making jewelry out of copper? Would you like a fun alternative to soldering? Then copper brazing is for you! Whereas soldering uses some form of solder to join metal, brazing uses a brazing rod, typically made of copper and phosphorus and requires no flux. The lower melting point of the brazing rod is crucial; the hot metal heats the brazing rod, causing it to melt and “flow” like solder flows. In her five-star-rated video Beginner Brazing for Copper Jewelry Making, Kim St. Jean describes the difference between how soldered pieces vs brazed piece are connected–with her fingers, above (soldering join on the left and brazing on the right). In soldering, the metal heats and creates openings (between the fingers, above) into which solder flows. But with brazing, the molten brazing rod binds or attaches the two metal surfaces (at the fingertips, above), similar to how glue binds two surfaces–but brazing is much stronger. 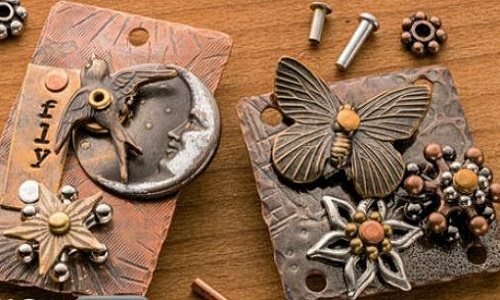 With an expert jewelry maker and instructor, you can learn this alternative metal-joining technique from the beginning–no soldering experience required. 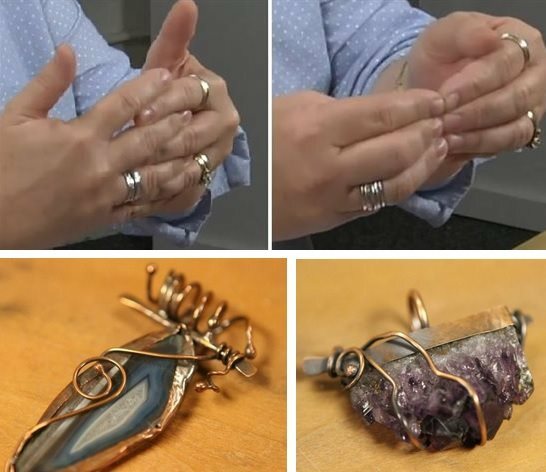 You’ll learn as she makes a bezel project (including a brilliant bezel-wire-cutting tip) and so much more from this expert teacher, including a great lesson about the hottest part of the flame that’s unlike traditional teaching on that topic. I love learning new stuff, don’t you? Using metal tubing instead of sheet metal means no sawing metal strips, no straight lines to worry about on those strips, and most importantly, almost no sharp edges to file and finish after you’ve cut them–perfect for bracelets! The only part you have to file and finish are the ends, and that’s quick work. The flattened tubing has smooth, rounded, finished long edges, with a nice sort of “lumpiness” and depth after you hammer it. You can think of the flattened metal tubing as pre-finished metal strips with interesting dimension. Plus you can get copper and brass tubing from most hardware stores. 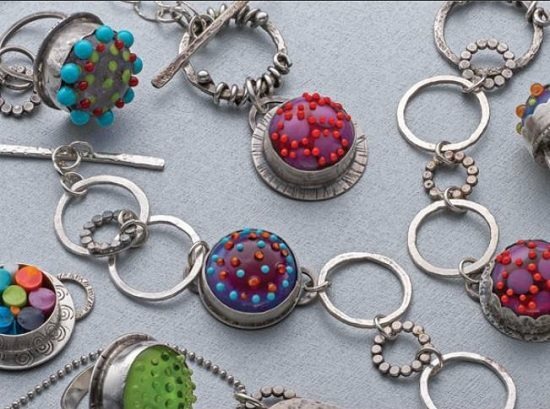 Tracy shows in detail how to make (and embellish with metal stamps and/or patinas, as well as beads, spacers, etc.) a bracelet and earrings and shows examples of necklaces that were made using the same technique. She even shows how to make your own handcrafted clasps. Bonus: It’s soft enough that you don’t need a torch to anneal it. The pieces Tracy shows in the five-star-rated Make Metal Jewelry with Tubing with Tracy Stanley use rivets or other cold connections, too, so you don’t need a torch for soldering, either. It’s a completely fire-free technique! Cassie Donlen’s video, Metal Jewelry Making with a Micro Torch, is an in-depth look at the jewelry-making techniques you can achieve using a micro torch, in a small space, perhaps even at your kitchen table! It’s not just a transition technique from stringing or wire jewelry making to metalsmithing; it’s three hours of fresh, real metalsmithing projects, like bezel setting and unique links for making bracelets (which you can modify for necklaces, rings and fabulous toggle clasps) and even post earrings (which I still don’t do–note to self, must make that leap!). Did I mention you can make all of that in a small space using an easy-to-find and easy-to-use micro torch? 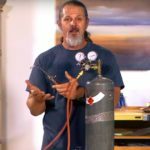 Plus you’ll learn about fusing, using liver of sulfur, how to understand the torch’s flame, flux, types of solder, and more. So if you’re intimidated by full torch-and-tank setups or don’t have the space for a full metalsmithing studio–or just feel like making artisan-quality metal jewelry in a smaller environment with a smaller investment, treat yourself to Cassie’s Metal Jewelry Making with a Micro Torch–then amaze yourself (and your family and friends) with all the jewelry you can make, even in your very own kitchen . . . or laundry room . . . or guest room . . . or anywhere you can carve out just a little space for your fabulousness to grow! Oh, rivets. You plague me so. Thank goodness Tracy Stanley shares her expert tips and instruction in a little gem of a video, Make Three Perfect Rivets for Metal Jewelry. In this short video, Tracy reviews three different kinds of rivets: wire rivets, premade rivets, and rivets made with escutcheon pins. Along the way she also shares expert advice on things like how to hold your hammer, how to use your tools to the fullest, and how to stack layers of metal–which I especially love, since I have a passion for stacking three or more things into flowers for rings, brooches, and pendants. If ever I was going to master making rivets, it’s now, with Tracy’s help! She’s a clear and thorough teacher, and her tubing video was so brilliant, I know she’s the perfect person to help me (and you!) master rivets. If your jewelry-making passion has to be limited to a small space, remember two things. One, it’s still your studio–proudly call it so! And two, there are many, many things you can make in a small space, on a kitchen table or hall desk, in a family room corner. If you’re able to ensure that sharp and toxic supplies are kept safely away from pets, children, and other “unknowing” folks, there are no limits to the jewelry you can create in a small space! Updated April 4, 2019. Originally published March 2015. 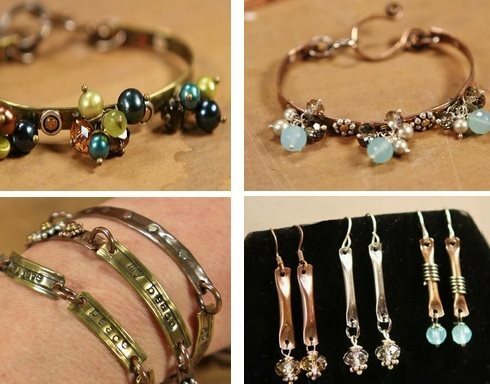 Learn to make big-time jewelry in a small space with these experts!